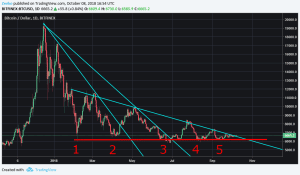 Bitcoin has once again broken out of the downtrend channel that started in February earlier this year. It is the seventh time now that Bitcoin is making such a move. So while many traders are bullish already, a look at this chart should discourage any premature optimism about a rally. In any case, the downtrend channel is tapering which means that a critical decision is ahead of us. The market seemed undecided for a long time. Many analysts have already called for a breakout and they have proven to be bull traps. Despite, all these false breakouts we have to modify our basically still bearish stance. Bitcoin has failed to start a new rally before starting a new rally. As of now the resistance around 5900 – 6100 USD seems strong. But the assumption that the resistance gets more solid with every failed attempt to bounce higher from this level is wrong. However, we have one major point to assume that Bitcoin could turn bullish from here on. To be precise, we have to narrow it down to short-term bullish. As as you can see in Fig. 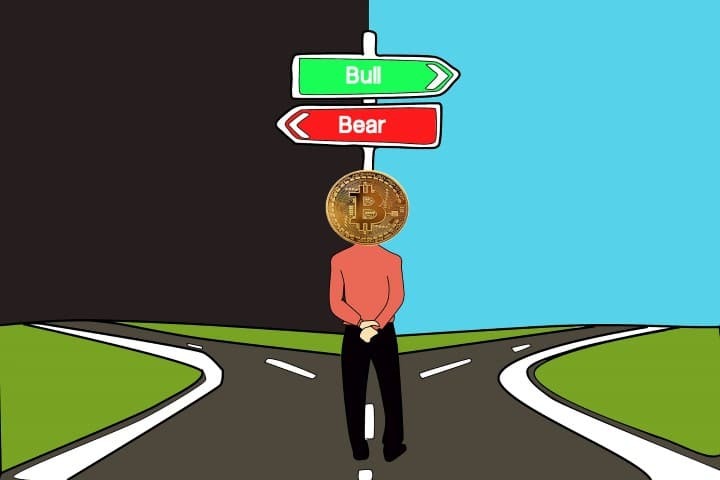 2 that we are still long-term bullish and from a long-term perspective Bitcoin has in fact not seen a real bear market yet. So, what makes us short-term bullish in the case of Bitcoin? The fact that the downtrend channel and the resistance line come closer and closer coincides with a very decisive period in the chart. Statistically, the period from October to December has the strongest upward movements in the chart. We estimate that these two factors are strong enough to create a short-term upward movement. But the starting point for the rally would need to be a strong performance at the 6800 level. If Bitcoin manages to stay above this level, the likeliness for a major upward movement is high. But how high could Bitcoin go from there? We currently see that Bitcoin is moving to the ‘overbought zone’ at the relative strength index chart (purple in Fig.3). Therefore, we can expect that Bitcoin could have a minor correction in the next days. But if Bitcoin moves above the 0.5 Fib level in green at about 6700, it is not unlikely that the chart could even reach the more important 0.618 Fib level at about 7200. If Bitcoin manages to move into that zone we are likely to have a short-term bullish case that could last until December. So, the likeliness from the 6800 for a bullish case is from our perspective is higher than the probability of a bear case. 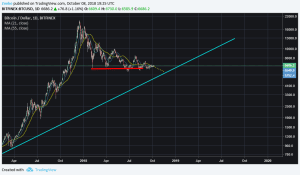 If Bitcoin should not reach this critical level it is likely that the chart stagnates for now. Postponing major movement to November or even December. From there on, we could start to talk about a real bearish case. That in our scenario would start in late December or January anyway. In any case, we hope you will trade well!